Hello mamas! Thanks for following along in my series! We are talking about what it means to be a work in progress, and discussing the stages we go through with life’s changes and seasons. 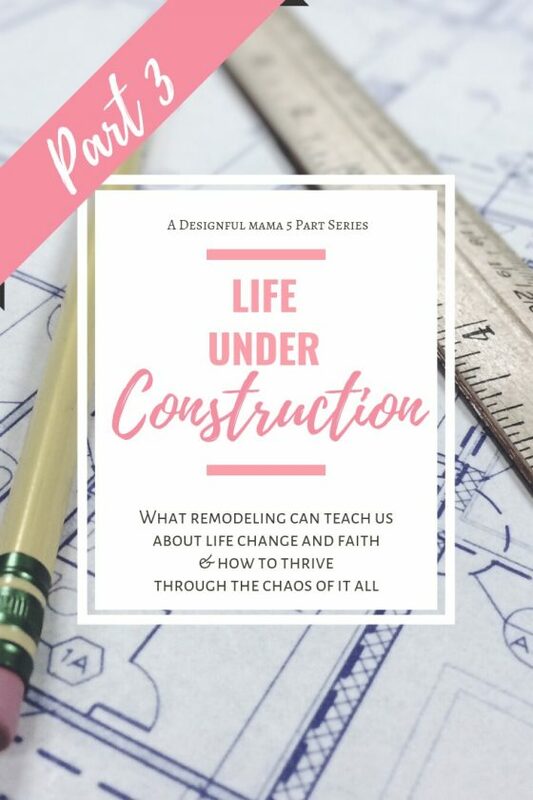 Specifically, we are looking at life change, and what this mama and designer has learned about it from my years in the construction and remodeling business. On Monday we discussed planning as the critical first step in any improvement project, and yesterday we talked about the promises and trust a project is built on. Today, it’s time to dig in and take a look at what happens when construction gets underway! Preparation is a neat and tidy, clinical word for the beginning stages of construction; I picked it because I was on a roll with words beginning with “P”… but what I’m really talking about here is a lot messier than that. Maybe a better choice would have been “phenomenal hot mess” or “pandemonium” – because that’s what it feels like! For improvement to happen, things have to get worse before they get better. And the bigger the change, the bigger the mess. Sometimes it’s a neat dissection, but more often we are talking about a down-and-dirty demolition. In life just as in construction, before new things can be added, and before reframing can take place, the old must be stripped away. Junk has to go, and walls have to come down. In my experience, demo means disruption, demolition, clutter and chaos. The biggest changes require the biggest upheaval. The past is being stripped away to make room for wonderful things! If you’ve ever lived through a remodel, you know from experience that there is nowhere you or your stuff can go where dirt and debris won’t find you. The contractor will take measures to contain the work area, but the hot mess has a way of spreading. Tools, building materials, extension cords, random God-knows-what, and a fine layer of grit that seems to find its way into even the tiniest places are just the beginning of the mess that is a construction zone. Life change and transitions are like that for us too, aren’t they? When we are experiencing chaos in one area of life, it just seems to ooze out of its little corner and infiltrate every part of our lives. It’s uncomfortable and it’s exhausting to try to keep up with it. My best advice: don’t fight the hot mess! Embrace it as part of the change. Have you ever been to a retail store (or for that matter, Disneyland) when they were in the middle of a remodel? They don’t close their doors unless the whole place is in a drastic overhaul (and even then, it’s only for a short time). Instead, they hang a “pardon our dust” sign up to indicate change is happening! An air of excitement and anticipation is created, and people can hardly wait to come back and see what’s new. Good friends are like that when we go through a life improvement too. They pardon our dust, love on us anyway, and are excited to be there to see the changes. It’s amazing how much stuff we have to clear out for even the smallest of projects. One of the most consistent things I hear from my clients as they go through a remodel is the frustration with how much stuff they have. Moving out of a space for a renovation means dealing with all our stuff. Getting it out into the open. Figuring out if it has a place in our lives or if it’s time for it to go. I recently wrote a couple of posts specifically focusing on simplifying the stuff in our lives, particularly when it’s holding us back from living live to the fullest. When it comes to life changes and seasons of transition, however, sometimes what needs to be weeded out is not a thing but an emotion, a habit, or a toxic relationship. If this is where you are, I encourage you to seek wise counsel, whether it’s from friends, family, clergy or a good therapist. And above all, take it to God in prayer and ask for guidance. Even small changes can be intrusive: when we replaced the windows in our great room, I had to pack away all my china, take down all the drapery and curtain rods, take the pictures off the wall, and move all the furniture and/or cover it up to give the guys access and keep things out of harm’s way. It looked like a full construction zone. Bigger changes mean we have to shift our way of doing things, creating a new “normal” until we can get settled in the new space. Kitchen remodels mean cooking on the grill, setting up a breakfast area in the garage, and washing dishes in the bathroom or laundry sink. Bathroom remodels often mean the front room becomes the closet. You may sleep in one place, get dressed in another, and brush your teeth in the kitchen sink. Improvements cause life disruption. We make temporary arrangements, but disruption can get old. It can get stressful. It can get harder to extend grace to those living closest to us. And it can become easy to just not let anyone in at all, out of embarrassment at the thought that they will see what a mess we’re in. There seems to be a point in the project when the strain of keeping up any semblance of normalcy becomes too much, and we stop cleaning up for the contractor (or anyone else). This is actually a good thing. It means we have let our guard down, and trust the contractor to do his job and not judge us. Which he won’t, by the way. In my role as a designer I often work as part of the contractor’s team. In the countless site meetings I’ve attended, never once have I seen or heard a contractor judge or make assumptions (nor have I done so) about a client’s housekeeping abilities or their stuff when the home is in need of a solution or under construction. It’s a construction zone, for goodness, sake! And so is life sometimes. It’s natural to want people only to see the best in us. The neat, the tidy, the un-judgeable. The parts that belong on Instagram, perfectly curated but completely imperfect at creating real life, meaningful connections that build a community and a place to be yourself. But maintaining that level of pretense is tiring. It saps us of energy, and takes our time and focus away from more worthwhile pursuits. We all have seasons of transition and change, and how refreshing would it be if we didn’t feel alone in that endeavor? One of my big goals when I started this blog was to encourage authentic living. And so I’d like to encourage all of us to embrace our mess. To be real and raw and messy and to let others in — and to support one another in their mess too. Life isn’t always pretty. We are all a work on progress, and we are always working on something. I would like to encourage each of us to be the kind of friend who can come alongside someone in a time of upheaval, when life is messy, and not judge the mess. Let’s extend grace to each other even when it’s hard, even when it’s ugly, even when we’re sensitive about our own mess. Let’s be honest enough to be vulnerable and to give and accept grace from those around us. That’s the kind of community we were created for! Join me tomorrow as we look at the 3 things we need to know about making progress! Yes! I want access to exclusive content.